The rapper is now on a mission to "shine a light" on how the criminal justice system treats minorities. The sudden release of the rapper Meek Mill from prison on Tuesday afternoon was a joyous moment for Clarise McCants, who like Mill was raised in poverty in Philadelphia. "Now we really have to work to free others who are being held unjustly," said McCants, 27, who has never met Mill but rallied for his release through her work as the criminal justice campaign director for Color of Change, a social justice nonprofit. Mill, 30, born Robert Rihmeek Williams, was granted bail by the Pennsylvania Supreme Court as he fights his conviction on drug and gun charges after a 2007 arrest. He was sentenced in November to two to four years in prison for a probation violation — a decision criticized by his supporters as too severe. Many pointed to the sentence as evidence of inequities in a criminal justice system where African-Americans are incarcerated at nearly six times the rate of whites. “This is an important moment,” Mill said Wednesday night in his first television interview following his release, with NBC News' Lester Holt. “This is a very important moment." He said he feels a responsibility to other young black men entangled by imperfect and historically biased law enforcement. "I got a lot of important people depending on me, and not talking about them people [public officials]. I'm talking about the men that's depending on me going through the same thing that I'm going through." 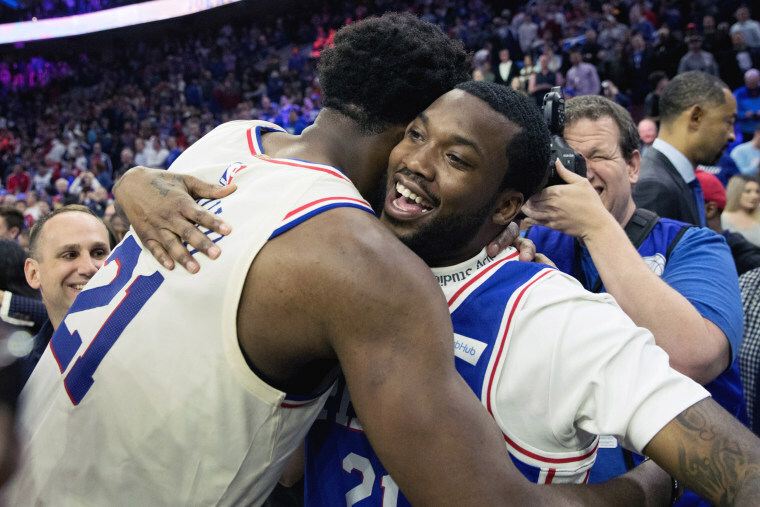 Mill, who spent his first night out after five months in prison taking in a Philadelphia 76ers playoff game, tweeted Tuesday that he is now on a mission to "shine a light" on how the criminal justice system treats minorities. The Philadelphia district attorney's office said it supported a new trial for Mill after one of the arresting officers in his case, Reginald Graham, landed on a list of officers suspected of lying in court and framing witnesses. Another former officer who took part in Mill's arrest said Graham lied under oath during the rapper's initial trial, according to a court affidavit. At the time, he was sentenced to eight months in prison before being released on probation. The judge's decision to free Mill, however, could affect other cases, said Philadelphia public defender Bradley Bridge, who has investigated and seen hundreds of cases reopened because of allegations of tainted police work. "Meek Mill is a perfectly good example," Bridge said. "He should have never been convicted or gone to prison." On Friday, a judge threw out the convictions of three other men who had been arrested by Graham, the officer involved in Mill's case. Bridge represented those men. He said more dismissals are possible now that a judge is set to review more than 100 pending petitions for new trials connected to Graham, who has since retired from the Philadelphia police force. Graham could not be reached for comment on Wednesday. Bridge said the problem of corrupt officers is far-reaching, with nearly 30 others found by the district attorney's office to have credibility issues, according to The Philadelphia Inquirer. That equates to 4,000 to 5,000 cases that need to be reviewed. "We're not done yet," Bridge said. A spokesman for the district attorney's office said Wednesday that it is continuing to examine the issue on a "case-by-case basis." The district attorney, Larry Krasner, who was elected last year on a platform of criminal justice reform, told NBC News this month that allegations of faulty police work have changed how prosecutors see Mill's case and others. "Across the board, African-Americans are ending up with worst sentences over and over than white people," Krasner said. Last year, Mill was arrested twice: once for allegedly popping a wheelie on a motorcycle while shooting a music video in New York City, and then for an altercation at a Missouri airport. Both charges were dismissed, but he was still found in technical violation of his probation. Supporters of Mill have questioned the judge in his case and accused her of being "overzealous" in sentencing him to prison time. But A. Charles Peruto Jr., an attorney representing Judge Brinkley, said in a statement that there's more to Mill's case. "This is a case of money, celebrity and justice," Peruto said. "When the county DA accompanies a defense attorney to the [state] Supreme Court to agree that he should be out, his release is no surprise. Whether Mill prevails on the merits depends on the credible evidence presented in June." The rapper's case has also benefited from the support of major artists like Jay-Z and Beyoncé, members of the Philadelphia Eagles and the Sixers, and Robert Kraft, the billionaire businessman who owns the NFL's New England Patriots. Mill says he wants to keep the momentum going. He said on "Nightly News" Wednesday that he’s asking supporters to use the hashtag #JusticeReform instead of #FreeMeekMill. Mill reached the top of the hip-hop charts with his 2012 debut album, "Dreams and Nightmares." But his celebrity status and money didn't protect him from winding up in prison on a probation violation, said McCants, the criminal justice reform advocate. One thing McCants hopes will result from the attention on Mill's case is more focus on the issues faced by the millions of Americans who are on probation. She hopes to end the use of automatic detainers, which are orders lodged by probation officers that can leave people locked up indefinitely without bail until a judge orders them released. According to a Columbia University Justice Lab analysis this month, Pennsylvania has the third-highest rate of citizens under probation or parole supervision in the country, behind Georgia and Idaho. Inmates locked up for violations of parole or probation make up one-third of the state prison population. McCants said Mill's probation since his arrest 11 years ago is "excessive" and shows how people can end up punished again for even the smallest infraction. "People are being caught in the probation trap," she added. "And it's like they're never getting free."